A comfortable and well presented self catering holiday apartment situated in a historic listed building overlooking the Royal Mile, just moments from Edinburgh Castle or St Giles Cathedral. The apartment is on the second floor. This unique apartment has four traditional window seats to the front where guests can sit and watch the ever changing bustle of the Royal Mile below. All rooms overlook the Royal Mile. Pillowstops is run my husband and wife team Catherine and Derek Gibb. "As a family we have used self catering properties around the world for our own holidays and know how important it is to make sure that when you arrive you are not disappointed with your choice of holiday accommodation. The two main areas of disappointment that we have found are location and standard! The apartments that we offer are situated in Edinburgh's no 1 historic tourist street being the Royal Mile and our apartments are maintained and cleaned to a very high standard exactly as we would want to find ourselves when going on holiday. We look forward to welcoming you to Edinburgh. Location, Location, Location. Edinburgh`s most popular tourist street just a two minute walk from Edinburgh Castle. Bathroom with bath and shower over, toilet and wash hand basin. The sitting room area is open plan with the kitchen area. Attractive finishings and furniture make this a lovely warm but bright room. A double fold out sofabed can be used to make sleeping arrangements more flexible. Electric hob and oven, fridge/freezer, washing machine/drier, dishwasher, microwave, toaster and kettle. Notes on accommodation: Radio/CD/DVD player. Games Books. DVDs. TV with Freeview channels. WiFi Internet connection. Outside: The entrance door to the apartment building enters directly out onto the Royal Mile. Cleaning / Towels / Linen / Maid service: Towels and linen included. Our favorite part of this flat was the window seats, affording great views of the happenings on the street below. Easy walk from train station and well equipped for our family of 4. My boys were thrilled to discover a tub of Legos on the bookshelf. Derek was very easy to communicate with and was gracious to allow us a late checkout as he had no one in straight after us. Great hub for exploring the city! 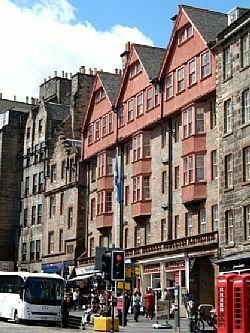 Great location on the Royal Mile, apartment is nice and clean. Would definitely stay here again. Wonderfully located apartment for the Old Town and all the sights. Everything you could need. The appartement was very clean and the beds were all set up when we arrived. Beds were so confortable it makes our stay very « Hygge ». I strongly advise this rent to visit Edinburgh. The access from the airport is easy thanks to the tramway, and going to tje Murrayfield stadium was easy. Nearest beach is at Cramond and is approx a 30 mins bus journey away. Airport is approx 30 minute bus journey from apartment. Railway station approx 5 minute walk away. 1 minute walk to Edinburgh Castle. 1 minute walk to St Giles Cathedral. 4 minute walk to Princes Street and Princes Street Gardens. 4 minute walk to Greyfriars Bobby Statue & Church. 5 minute walk to Waverley Train Station. 6 minute walk to Edinburgh Farmers Market (every Saturday). 15 minute walk to Holyrood House & Scottish Parliament. 15 minute walk to Edinburgh International Conference Centre. Wide selection of restaurants, pubs, shops and cafes within minutes walk of the apartment. Booking Notes: Full details and online booking and payments available on owners website. Changeover Day: Flexible changeover days. Notes on prices: The price quoted is the average cost during the year. Please check my own website www.pillowstops.co.uk for the exact price for your chosen dates and online booking.